Dana Borzomati is the owner and chief designer of Sweet Elite Cakery, where she is responsible for designing each of our perfect custom cakes. After receiving her Bachelors degree, she attended graduate school at F.I.T studying design and merchandise management. She spent the next 10 years working in various capacities within the fashion industry and while she loved what she did, she always felt that there was another path her creative talents needed to take her. Coming from a family with a background in the culinary arts. 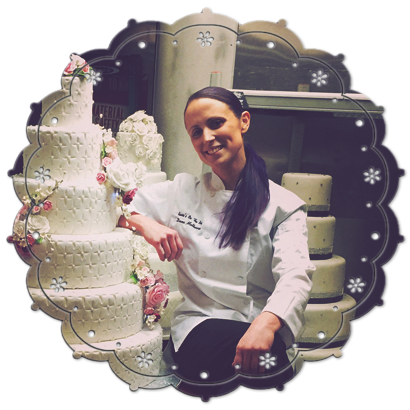 Dana decided to pursue her creative ambitions at the French Culinary Institute, learning pastry arts and the foundation of cake decoration. With these skills, Dana honed her craft making beautiful and astounding custom cakes. She spent the next 5 years working and building a family run bakery while she perfected her craft. During that time Dana was featured in multiple major wedding magazines, radio interviews, tv shows, and even local print! As Dana progressed as a professional, so did her vision. Her quest for continued professional growth landed an opportunity at Russo’s on the Bay in Howard Beach, NY. The Russo name has long been considered the standard in hospitality for over the past 50 years, beginning with the Villa Russo in Richmond Hill by Frank Russo Sr. and continued by his son Frank Russo Jr. who opened Russos on the Bay in 1987. Frank Russo Jr. has achieved the epitome of success and customer satisfaction with his exquisite cuisine combined with his professional attention to detail and relentless work ethic. A work ethic that is so true, that it continues to both inspire those around him, but shows a genuine appreciation to those same people as well! Dana is so amazingly proud to offer Sweet Elite Cakery in collaboration with the Russos organization. Sweet Elite Cakery is the luxury experience that you know and expect from the Russo’s brand exhibited in a custom, one-of-a-kind cake experience delivered right to your doorstep. We hope that you consider us and our custom cakes for your next occasion and allow us to make it as special as it can be!